We’ve all seen teenagers immersed so deep in a virtual reality (VR) video game that dragging them back into the real world seems impossible. VR technology can engage the mind in new and interesting ways. Now, VR is starting to prove that it’s got some serious game beyond playtime. Goldman Sachs estimates in a recent report that VR and augmented reality (AR) technology could grow into a booming $128 billion market by 2025. The company predicts that VR will take the lead over AR, as VR has experienced more technological progress and momentum to date. It also notes that AR tools are a bit more nascent, while VR has an ecosystem of vendors, partners and solution providers that are pushing it forward into business applications. Goldman Sachs is predicting that VR technology has the potential to disrupt several markets, including education and training, healthcare, real estate and retail. The report adds that if VR technology becomes as lightweight as a set of glasses, it offers the potential for multiple devices and functions to be combined into one—and it could replace phone and PC environments. Experts at Intel see a similar growth path for VR. “Even though the market is being driven by gaming today, we expect commercial VR to be 50 percent of the market as soon as the next five years,” said Kumar Chinnaswamy, director of commercial VR in Intel’s Client Computing Group, in a recent report in Intel iQ. Immersive training in medical education is one early use case of VR technology that is already getting an A+. Scientific illustration company Blausen Medical based in Houston, TX, has taken immersive training to the next level by adding VR capabilities to portions of its large portfolio of animations used by medical school students. While med students traditionally learn about body structures in books and models, Blausen Medical has infused new life—and layers—into medical teaching. Its illustrations can now expand to enormous sizes, and students can experience them from different angles in VR. The Blausen app positions the VR user in the center of the human anatomy animation. The student with VR goggles can feel what it’s like to be as small as an atom, and watch in VR as proteins and molecules move from side to side. “Once you have the experience of animation in VR, you can’t go back to the textbook,” says Bruce Blausen, CEO and founder of Blausen Medical, in an article in Intel iQ. 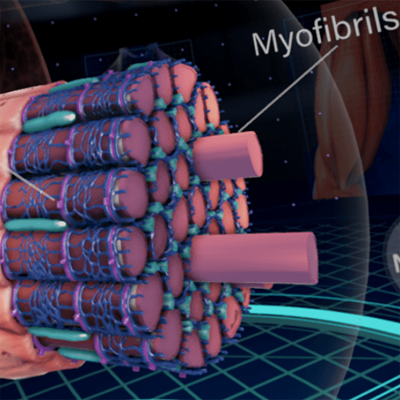 The company’s first VR model captures a human’s skeletal muscle contractions. Eventually it plans to convert its entire library of medical animations into VR, including VR experiences through the inner ear, the cardiovascular system and explorations of diseases in the body. The company plans to sell its VR apps to universities and medical institutions, helping future doctors better understand the functions of the body. But the VR experience won’t be relegated to doctors in training. The Goldman Sachs report notes that VR/AR has the potential to be a standard tool in education. It predicts VR in education to have a user base of 15 million by 2025 and generate $700 million in educational software revenue in 2025. It could revolutionize the way students are taught for both the K-12 segment and higher education. Students, for example, could learn about the solar system or a historical event by interacting with the virtual worlds. Google is already offering Cardboard to schools for free, and it has developed more than 100 virtual field trips. In all grades and levels, the commercial uses of VR are expanding, as access to the technology grows. By creating immersive experiences for students, their real and digital worlds may seamlessly merge, rather than collide, in the years to come. Learn more about creating VR and AR computing environments using processors and technology from Intel. See how VR entrepreneurs are rethinking real estate, retail and education in the latest blog from Intel iQ.